The slo-mo videos has been kind of a big deal about the iPhone 5s since Apple announced the fella in September. The iPhone 5s indeed outputs 720p videos at 120 fps, but does it record them in 720p resolution as well? As it turns out – it does not. A reader of ours tipped us the Apple iPhone 5s doesn’t actually capture proper 720p footage when you enable slow-motion recording and since we had already noticed that those videos have less captured detail than expected, we though a more detailed investigation was in order. It’s like they were recorded in lower resolution and then upsized to 720p. Here’s the experiment we did. We took a slo-mo video with the iPhone 5s and a regular 720p video with another smartphone simultaneously (because the iPhone 5s can’t record regular 720p videos). 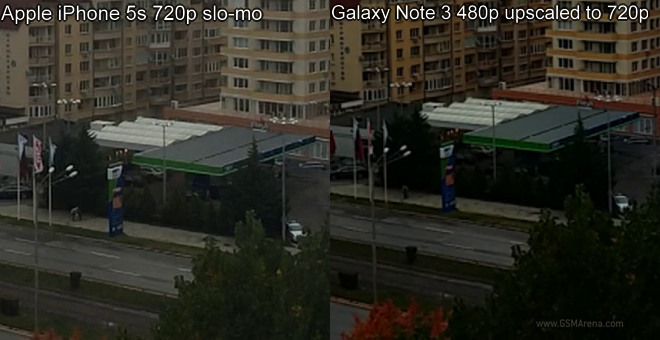 As you can see the Note 3 video has notably more detail than the iPhone 5s. Then we decided to downsize the Note 3 720p video snapshot to 480p and after that upscale it back to 720p resolution. Bingo! Now this upscaled shot looks a lot like the iPhone 5s captured frame, doesn’t it? Here are the complete frames extracted from the videos, which you can compare as you please. 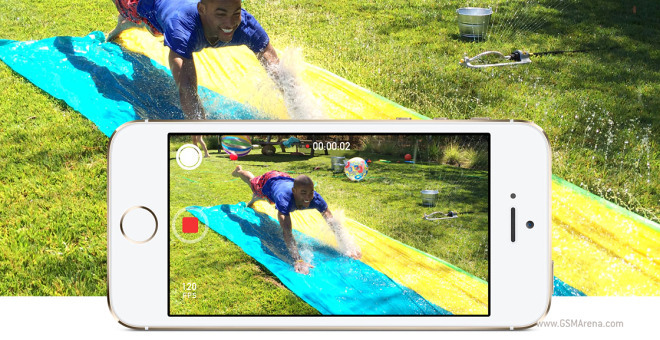 We think Apple iPhone 5s is actually shooting 480p videos and upsizes the captured frames to 720p resolution. It isn’t such of a big deal, but the per-pixel quality is far below Apple’s usual standard and that’s obvious even to the untrained eye. The Cupertino guys made those slo-mo clips sound pretty awesome, but they aren’t looking as hot as they should have. The slow motion clips might look cool on your iPhone, but they look quite disappointing on a TV or a monitor. Which reminds us of our other disappointment about the feature – when we tried to play those iPhone 5s slo-mo videos on a PC we found that unlike all previous slow motion-capable smartphones, the iPhone 5s actually encodes the video at 120 fps and your computer will play it on 120fps unless you explicitly force it to slow the video four times in order to achieve the desired slow-motion effect. It would have been way more natural the iPhone 5s to process the frames and output a standard 30fps video as most of the phones do, which doesn’t require special players and tools to play properly. Here’s hoping Apple fixes this promptly with an update – it certainly can’t be that hard.